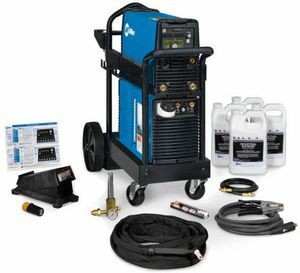 The Miller Dynasty® 210 Complete With Wireless Foot Control is a water-cooled, 210 amp, AC/DC TIG welding package that comes with everything you need to start welding (except welding wire and shielding gas cylinder). The system features the Dynasty 210 CPS (Cooler Power Supply) with dedicated power receptacle for the included Miller Coolmate™ 1.3 water cooler. The Dynasty 210 complete package also includes 250 amp water-cooled TIG torch, gas flowmeter, gas hose, wireless remote foot control, four gallons of torch coolant and a running gear with cylinder rack. The Dynasty 210 can weld up to 1/4 inch thick aluminum and 1/4 inch thick steel. The Dynasty 210's inverter design makes this welder compact and lightweight (only 50 pounds). The 210 CPS features user-friendly weld control interface and comes complete with memory card expansion slot for maximum flexibility and expand-ability. Miller's Autoline™ automatic input voltage sensing allows the Dynasty 210 CPS to be hooked up to 120 volt to 480 volt, single phase or three phase, input power without manual linking. The Miller Dynasty® 210 CPS TIG welder provides the basic features that are required for most AC/DC TIG or STICK welding applications, including pulsed DC TIG welding and provides operator-friendly, menu-driven features. Auto-Line™ provides state-of-the-art flexibility by automatically connecting to 120-460 VAC, single- or three- phase power without removing the covers to relink the power source. No longer is there a concern if you have the correct machine for the shop or the job site. Extended AC Balance (60-80%) controls the amount of oxide cleaning (amperage time in EN) which is essential for high quality welds on aluminum. AC frequency (70-150 hz) controls the width of the arc cone and the force of the arc. 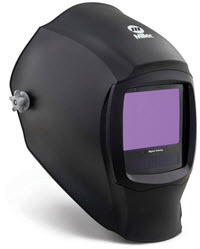 FREE Miller® Digital Infinity™ auto-darkening welding hood. Helmet ships with order. InfoTrack® features arc time tracking, time and timer functions, and a multi-language help menu. Redesigned headgear with oversized comfort cushion provides extensive adjustability, settings, and enhanced support. Genuine Miller Independent AC Expansion Memory Card for your Dynasty® 210 or Dynasty® 280 series TIG welder. Genuine Miller Automation Expansion Memory Card for your Dynasty® 210, 280 or Maxstar® 210, 280 series TIG welder. Genuine Miller Modbus® Expansion Memory Card for your Dynasty® 210, 280 or Maxstar® 210, 280 series TIG welder. Im ready to make the jump. Just curious about the rebate. I thought the $690 rebate for this package ran until the 30th. Today I see the price of the complete welder package has changed, and so has the rebate. Other vendors still show the $690 rebate. I like cybewelds service and products better, and would like to buy through cyberweld. What is thecurrent price, and current rebate? Looking to purchase early tomorrow,. Thanks in advance. The Miller Dynasty 210 Complete With Wireless Foot Control 951667 comes with a standard Dynasty 210 power source. The Miller Dynasty 210 DX Complete With Wireless Foot Control 951669 is the package that has the $690.00 rebate. This package comes with the Dynasty 210 DX power source. The Miller Dynasty 210 Complete With Wireless Foot Control 951667 would be shipped from our New Jersey warehouse.It would take about 3 to 4 days for you to receive it.